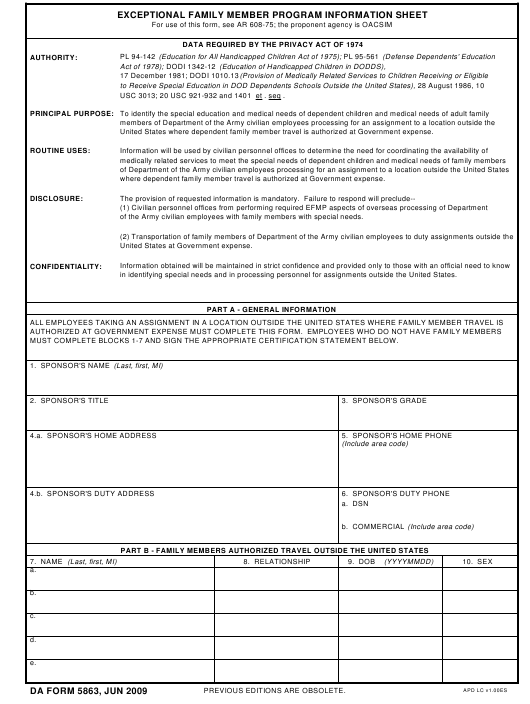 DA Form 5863 or the "Exceptional Family Member Program Information Sheet" is a Department of the Army-issued form used by and within the United States Military. The form - often incorrectly referred to as the DD form 5863 - was last revised on June 1, 2009. Download an up-to-date fillable DA Form 5863 down below in PDF-format or look it up on the Army Publishing Directorate website. USC 3013; 20 USC 921-932 and 1401 et . seq . United States where dependent family member travel is authorized at Government expense. where dependent family member travel is authorized at Government expense. of the Army civilian employees with family members with special needs. United States at Government expense. in identifying special needs and in processing personnel for assignments outside the United States. MUST COMPLETE BLOCKS 1-7 AND SIGN THE APPROPRIATE CERTIFICATION STATEMENT BELOW. REGULARLY BASED ON THEIR PRESENT MEDICAL CONDITION? BUT ARE NOT BEING SEEN? e. ARE ANY OF THE ABOVE FAMILY MEMBERS ENROLLED IN A SPECIAL EDUCATION PROGRAM? f. DO ANY OF THE ABOVE FAMILY MEMBERS HAVE A LEARNING DISABILITY? g. ARE ANY OF THE ABOVE FAMILY MEMBERS BLIND, DEAF, OR HARD OF HEARING? i. DO ANY OF THE ABOVE FAMILY MEMBERS HAVE A PHYSICAL DISABILITY THAT COULD AFFECT THEIR LEARNING? AS ABUSE OF ALCOHOL OR DRUGS, RUNNING AWAY, SKIPPING SCHOOL, OR OTHER DELINQUENT-TYPE ACTS? (1) I CERTIFY THAT I DO NOT HAVE FAMILY MEMBERS. I INTEND THAT THE FAMILY MEMBER OR FAMILY MEMBERS WILL TRAVEL WITH ME CONCURRENTLY. I INTEND THAT THE FAMILY MEMBER OR FAMILY MEMBERS WILL TRAVEL ON A DELAYED BASIS. THE LOCATION OUTSIDE THE UNITED STATES.